Round base magnets are powerful, low-profile magnets with an attachment hole. Latch magnets make great cabinet and gate closures. Add a hook or knob, and these ceramic base magnets are perfect for holding and positioning shop lights, tools, plants and more to steel surfaces such as refrigerators, filing cabinets, metal beams, walls and doors. Extra strong ceramic magnetic bases can suspend heavy items such as speakers and spotlights. 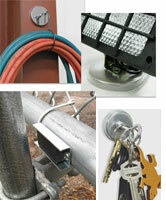 Also useful for securing hoses, tools, extension cords and more. Ceramic latch magnets can easily secure a parking lot gate, cabinet or shop door.